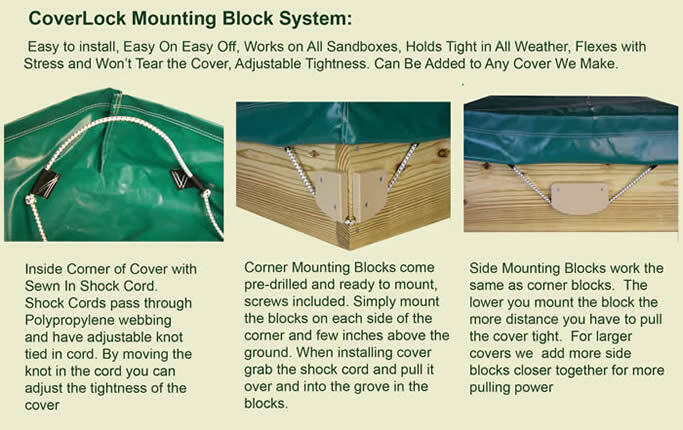 The CoverLock System consists of sewn in adjustable shock cords on the sides and corners of the cover, used in conjunction with our Mounting Block Kit. This patented system is designed for simple, everyday usage, providing an effective solution for keeping the cover in place. An effective cover is one that stays in place and easy to put on and take off! We offer a variety of materials that range from solid vinyl coated polyester, to heavy duty vinyl coated mesh fabrics. These fabrics are all designed to be used outdoors and endure the elements year round. Our most commonly used 13oz Vinyl Coated Polyester Fabric is light weight, flexible and meets the highest UV ratings available. It's outstanding quality will with stand the high temperatures in the south as well as the subzero cold in the North. For these extra heavy duty jobs we offer 16-18oz vinyl coated polyester. All of our fabrics are available in a large variety of Colors. Just specify the color of choice at no extra charge. For a FREE, no obligation quote for your custom cover, simply download the Request A Quote Form. 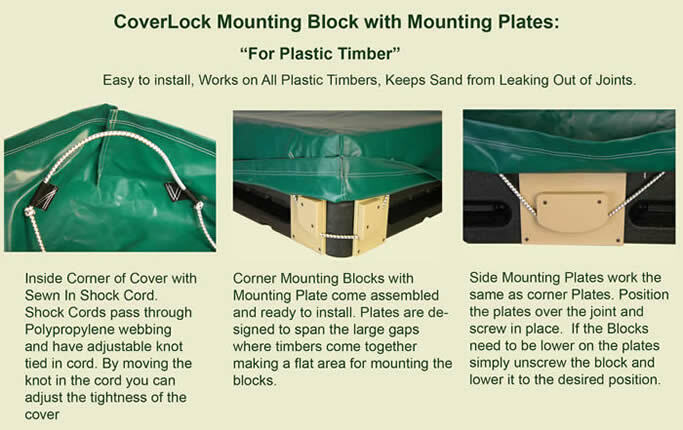 Complete the information and email to coverlockcovers@yahoo.com. When possible please include a picture of the sandbox so we can give you the best possible option for your cover. Once we receive you info we will email you back a written quote with in 24 hrs. When you decide to place your order please use the CoverLock Order Form. With each order we will provide a detailed drawing with confirmation and production date. .Please note, standard lead time for our custom covers run approximately 3-4 weeks after date of purchase. Feel free to call us at (630) 476-1910 to discuss any questions/concerns, or for further assistance in designing the right cover for you.